← Coloring Books For Adults: Color Me Some Relaxation! The other day on Facebook I saw this picture of a GORGEOUS room from New England Home. 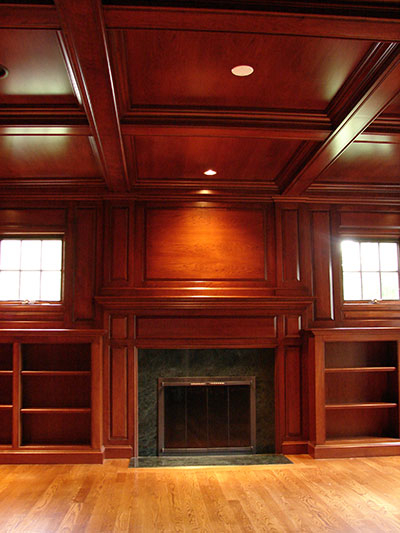 The question here was, do you leave the mahogany in this room or paint it? My heart flew out of “you know where” when I saw the word “paint” and “mahogany” in the same sentence. I’m sorry to be blunt but seriously, what knucklehead would paint over this gorgeous wood????? Don’t get me wrong – I’m all for painting over wood IF and I say IF – you have the dreaded orange wood in your home or dated oak or maple but NOT mahogany. That’s like putting ketchup on a filet mignon. Well I love ketchup but I know that it’s a faux pas to put it on a really good steak. The article goes on to say that a young family wanted to update the room from a Dad’s Den to basically a glorified bonus room. Which I do understand. Younger families have kids to accommodate, to make safe and they need a kid friendly room – I get that. However, can you have saved this room for a “mom and dad” zone and give the kids another room? Take a look on the link I have above to see how they painted this room. It’s white and gray and in a VERY high gloss. High gloss? This is like a triple whammy. Not only did they paint a rich wood, and in lifeless gray and white for a kids room – not very kid friendly if you ask me – but they chose a high gloss paint! I guess they can always hose down the room when the kids are done playing. What are your thoughts about this? Do you put ketchup on your fillet mignon? This entry was posted in Furniture and tagged mahogany, wood furniture. Bookmark the permalink. 8 Responses to Mahogany Wood: Paint It or Not? Interesting! I have a similar room (white ceiling, dark paneling in a similar style but not solid mahogany) – I’ve so far resisted painting. Mine seems to have restful bookish atmosphere I like, but I’m told I may need to paint when I want to sell. In the house in your photo – I’ll bet future owners will be restoring it someday, just like in Arts-and-Crafts homes now are thrilled to find quarter-sawn white oak under layers of paint. Argh. I wouldn’t paint mahogany, or any “fine” wood. They can be rejuvenated. With proper lighting and furnishings, this empty room could be transformed into a light and bright space. My house would be haunting me for years if I covered up that would Cheryl. I’m with you. Let’s here it for mahogany! I’m just not a fan of painting wood – even it it’s that nasty dreaded orange wood in the kitchen that I talk about all the time – stain it. I’ll preserve the life and energy in the wood. I tried to open the link of New England home that you have but it was blank. I really wanted to see the disaster, but couldn’t. Did anyone else have a problem with it? Try again. I was able to open it just now. I still can’t believe that they painted over this wood. I’m still getting feedback on twitter, here and on facebook about this – phone calls too! I bet the Designers that said painting it gray is a good idea are a bit red in the face right now.